"Hollywood's Hottest New Designer", as coined by IN TOUCH. Los Angeles based designer CC SKYE wanted to freshen up her online presense by bringing her "IT" Girl style to their web presence. High Octane Brands with presented with teh challenge of taking a print marketing based design and transalting it into a web based shopping experience. As every web designer knows, translating print to web can be quite an ordeal. 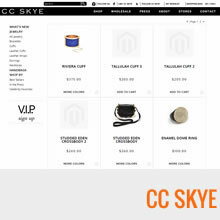 Working closely with CC SKYE's creative agency of record, the CC SKYE team, and CC SKYE herself, we were able to present options that kept true to the print campaign, provided an extraordinary user experience, and a seamless transition to a much larger ecommerce solution. An integrated print and web campaign coinciding with a timely interview on the today show produced significant increases to teh CC SKYE presence in the accessories and handbags market.